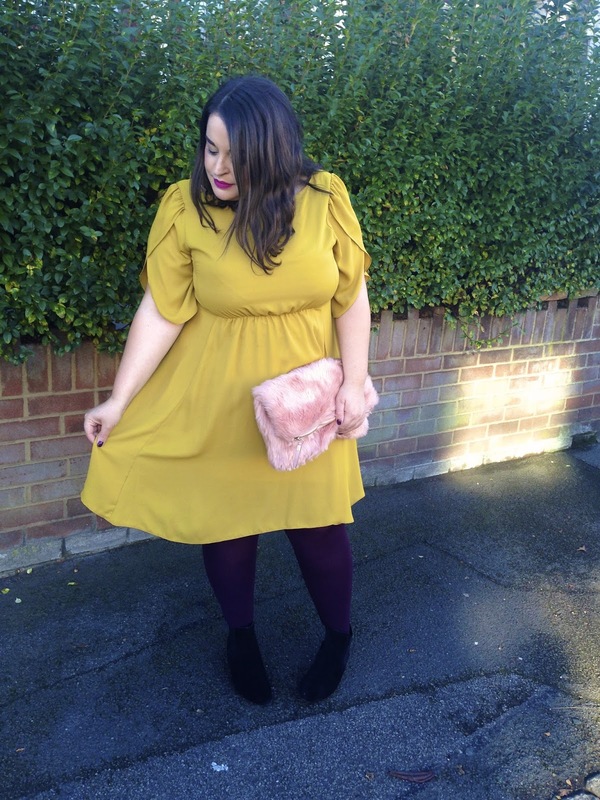 If you're like me, you like to have options and thankfully the amount of plus size brands available to us are increasing constantly and I am excited to introduce you to a beautiful new brand called That Day - available to buy at Evans. Their first collection has a mix of modern and vintage styles and includes floaty dresses, longline shirts and tops. The prints and colour palette of their first drop are perfect for this time of year and it's really nice to have another brand to stalk when I'm on the Evans website! When an email popped up in my inbox offering me the chance to review some items I couldn't say no. I love being able to show you guys what's available and to show you new brands. 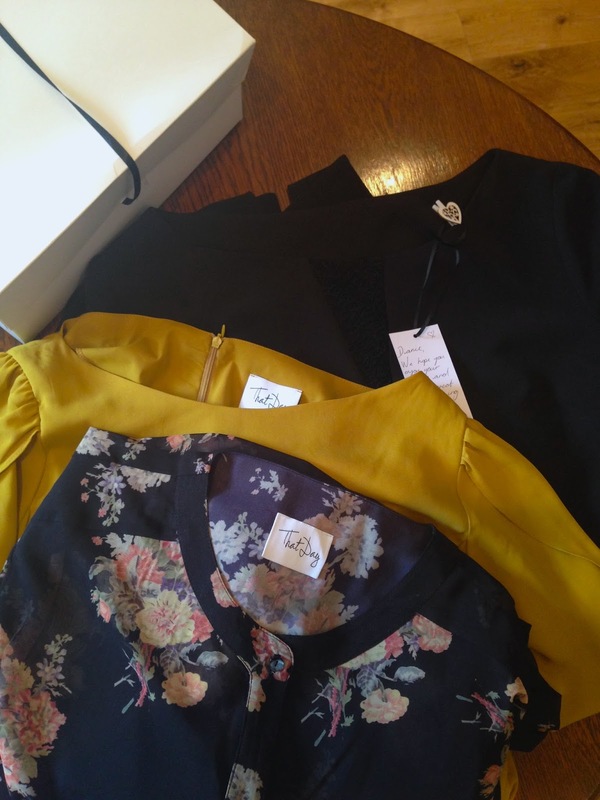 They sent me three gorgeous pieces and the way they packaged them up really impressed me. I love when a brand take the effort to wrap things up beautifully and it made opening the parcel even more exciting! 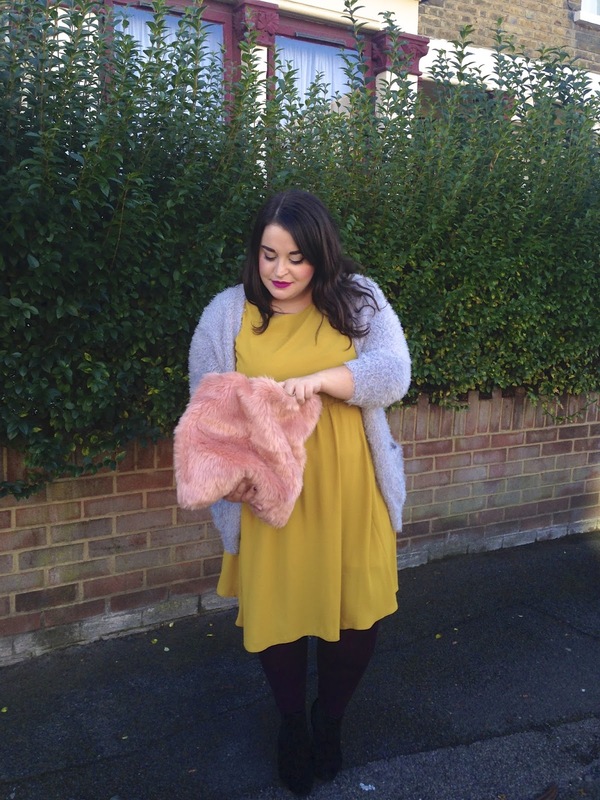 Last week I spent the day with my Family, including my new teeny tiny niece, Eloise (omgggg she's SO amazing) and I chose to wear the gorgeous mustard dress. I sized up one size to a 22 and I would recommend you do the same if you like the dress. I am a massive fan of the sleeves - such a nice touch and something a little different. My Mum said it reminded her of a baby pink dress she had back in the 70s that had the same sleeves. 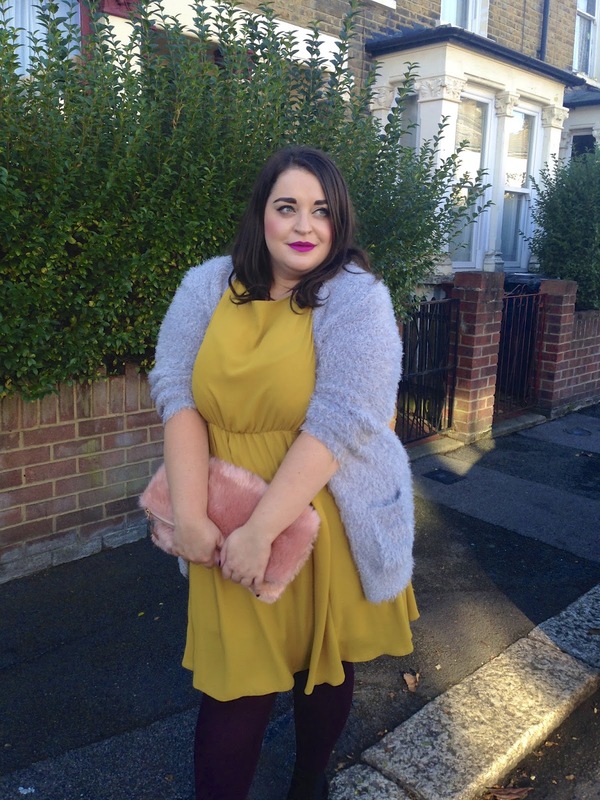 Mustard and grey is one of my favourite colour combinations and I knew I would be cold if I wore the dress on it's own so I paired it with my *grey eyelash knitted cardigan from Yours Clothing. That cardie is so good, it's like I'm permanently being cuddled when I wear it. What do you think of my furry clutch bag, guys? I spotted another one on ASOS a while back but when I saw this cheaper one from New Look I had to snap it up. My black boots are from Topshop and I am wearing them constantly at the moment. I generally like to wear shoes that have heels on them and the heel on these isn't high so you can wear them all day and your feet don't hurt. My tights are old ones from Autograph at M&S and are a lovely Aubergine colour. Well ladies, I hope you all take a look at what That Day have to offer, let me know what you think and I will be back soon to show you the other two styles I have hanging waiting for me in the wardrobe. You look truly beautiful! 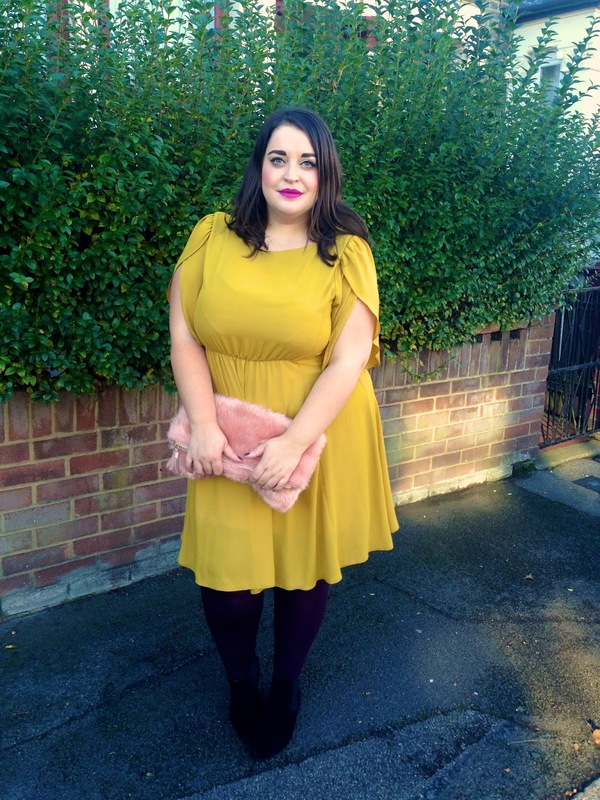 The dress is really flattering and the mustard compliments your skin tone and colouring perfectly. Where if your lipstick from? I could do with one in that kind of colour! Charli thank you lovely!!! The lippy is from Sleek, and its called Mystic. I LOVE their lippies! It would look lovely on you!! Thanks for the tip on the boots, bought a pair on Friday... they're just perfect. 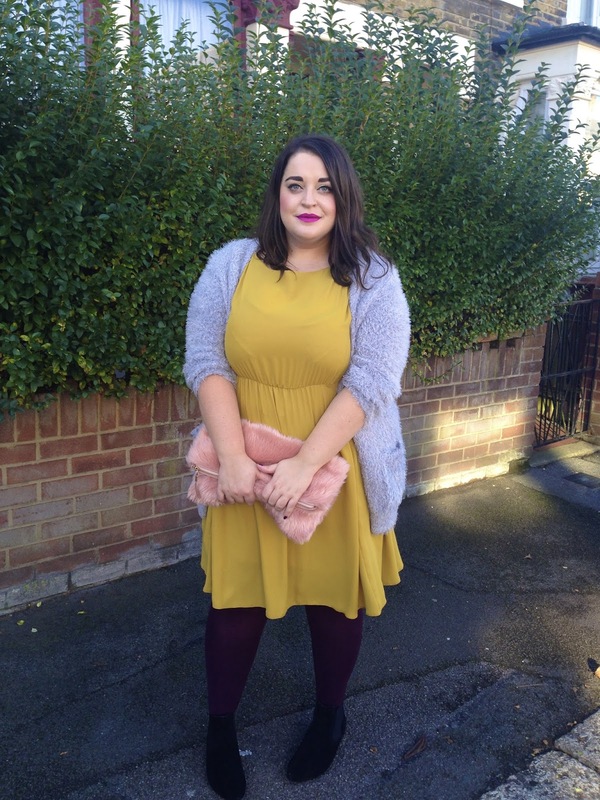 I often forget about Topshop as their size 16s NEVER fit but their accessories are great. Don't think we've seen you in this colour before, but it works well on you. The dress is really pretty. Love the bag, have you seen the NL fluffy cat ones? I got the pink and black and they are massive!! They kinda look like squished roadkill, but I find they are in the 'so ugly, they're amazing' category! Oh my goodness that dress is to die for! 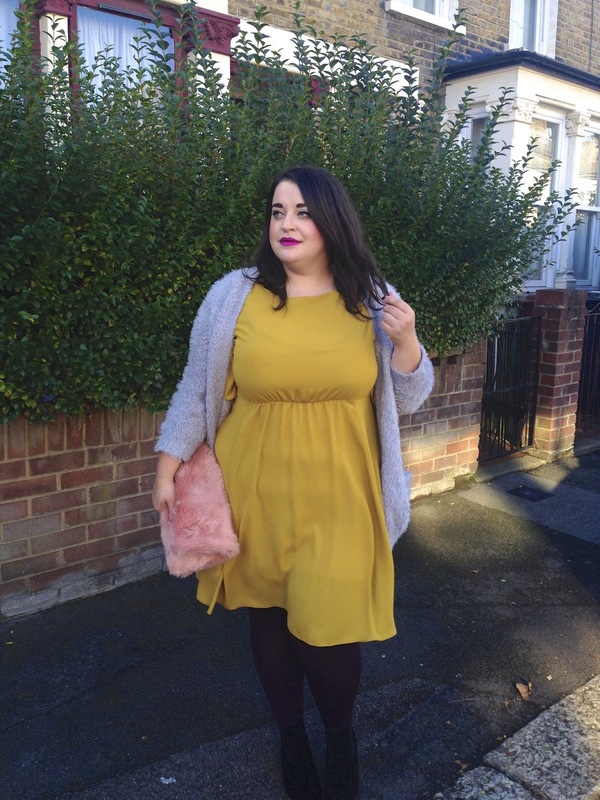 I absolutely adore wearing mustard yellow! I would be ALLLL over this look! You look ravishing in this, my dear!